The Huawei Honor 8 just made our list of the most wanted midrange phones of 2016 (between $250 and $500) because of its impressive specs at a price that can go down to $300 sometimes. Well, now is one of those times. The Honor 8 is being discounted at several online retailers with lots of free goodies to sweeten the deal even further. Newegg has the best deal on the Honor 8, offering $100 on both the 32GB and 64GB models in all of their available colors: black, white, blue, and gold (only 64GB). This brings the price down to $299 and $349, respectively, but Newegg is throwing in a bunch of freebies: $50 Newegg gift card, Huawei Honor 8 case, Huawei Gift Box (includes selfie stick, extra power charger and USB-C cable, and Micro-USB to USB-C adapter), and a JBL Synchros E40BT Bluetooth headphones that has an MSRP of $125 (now priced at around $90 on Amazon) in pink. There are two small inconsistencies to note on Newegg's deals. First, the white 64GB is the only one on the list above not getting the JBL headphones, for some reason. Second, the blue 64GB version is discounted $100, but it won't ship before December 25 and it doesn't come with all these goodies, just the free case, Gift Box, and a Dr Strange case with a set of Honor Grey headphones. Not a bad deal, but a little less than what the other variants are getting. 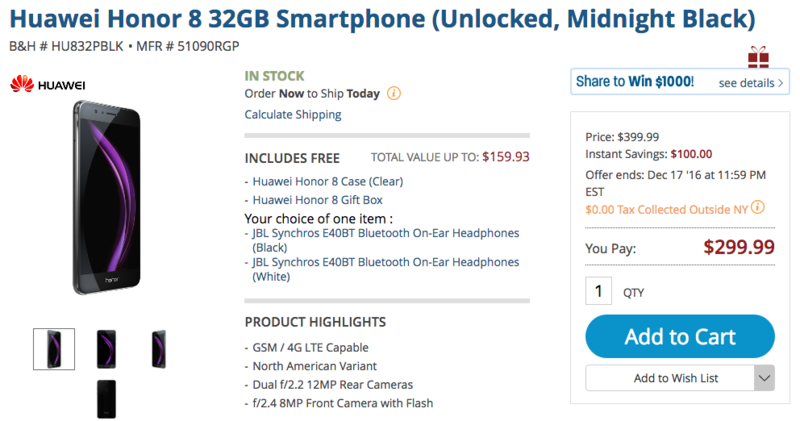 B&H has the second best deal on the Honor 8 with the same $100 discount on the black 32GB and 64GB model and the white 64GB model. All other variants are not seeing any price drop. All models, including the not discounted ones (but except the 64GB blue), get a free case, the Gift Box, and a choice of the JBL Synchros E40BT in white or black. It could certainly be more appealing than the pink one Newegg is offering, but remember that you're not getting any $50 gift cards here. Best Buy has the least appealing deal of the bunch, with $100 off all of its colors and storage variants, but only a free case and a Dr Strange kit including another case and a comic book. For comparison's sake, Amazon is price-matching these deals with all Honor 8 variants on sale at $100 off but without offering anything free with the device. All deals will be valid for the next 3-4 days on most retailers, so you have a bit of time to make up your mind before putting an order in. Here are the handy links for all 3 retailers' Honor 8 variants.